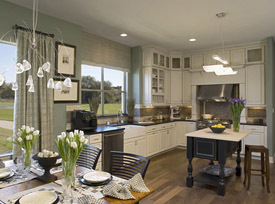 This is a kitchen designed by Sheree Artes of Arrowwood Cabinetry for a Toll Brothers showcase home. The kitchen features an open floor plan that combines modern interior design with the Coventry II Maple Square Full Overlay cabinets from Cardell Cabinetry painted in Designer White for a cozy contemporary country feel. This entry was posted on October 7, 2008 at 10:47 pm and is filed under Design, Kitchen, Kitchen design. You can follow any responses to this entry through the RSS 2.0 feed. You can leave a response, or trackback from your own site. You have some very slick ideas for your kitchen. That has been one of the recurring themes in my own life–looking for a way to make our bathrooms and our kitchen look really glorious, even though those rooms are much too small. One of the glories of the Internet, though, is there is absolutely no dearth of ideas. I have been looking for ones that seem to me to make sense and posting my results. Right now I have no idea of what I will ultimately do, but I keep hoping I will come up with something really slick.